The powerful work of Martha Graham and several of her colleagues of early modern dance was brilliantly performed here last week. It is sad to say that there were only two shows available. This company, which has been sustained and maintained by Artistic Director Janet Elber and Artistic Associates Joyce Herring and Denise Vale, deserves to be seen more often. 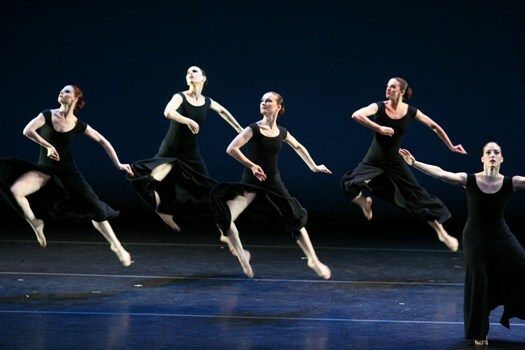 It is not only that they are fine dancers, but also that their program provides an important historical background to 20th century modern dance. New York’s New Dance Group, along with other early modern dancers, took up several social justice causes that raged through the country in the 1930s: discrimination, homelessness, poverty and stagnant politics — many of the same issues prevalent today. Dance was a weapon in the class struggle, as the New Dance Group maintained (those were Marxist days), to bring the message to the stage. Three outstanding solos in this concert made that clear: Eve Gentry’s “Tenant of the Street” (1936) marvelously danced by Carrie Ellmore-Tallitsch; Martha Graham’s “Spectre-1914” (1936), the first episode of “Chronicle,” danced by Blakeley White-McGuire; and Sophie Maslow’s “I Ain’t Got No Home” (1941) a Woody Guthrie Dust Bowl ballad danced by Tadej Brdnik. Each soloist fully commanded the tension and terror of their respective work, though each was stylistically different in both musical and staging treatment. My personal favorite was Gentry’s piece. Ellmore-Tallitsch gave us a range of emotions, from apprehension to anxiety, that exposed street life. Her hands and arms, the tension in her head and neck and the flat-footed walk that grew and diminished all gave a fine dramatic portrait. Brdnik caught the Dust Bowl folkways as well as the hopelessness, and White-McGuire handled the “Spectre-1914” pathos and heroic stance in the huge red costume with aplomb. The reconstruction of Isadora Duncan‘s “Revolution” to the music of Aleksander Scriabin, danced by Katherine Crockett, was not as effective as the others. This old Duncan dancer (who knows the work), felt it needed more weight, “gravitas,” and a deeper acting style. The appreciative audience was favored with a reconstruction of Graham’s “Steps in the Street,” a long work employing the whole company in images of war, devastation, homelessness and exile. It proceeds on to “Prelude to Action,” ultimately involving “Unity and Pledge to the Future.” “Steps in the Street” is often noted as the best and most serious political dance statement made by Graham: Later, she devoted her choreography to mythic and personal dances. The visual beauty of Isamu Noguchi‘s stage set for “El Penitente” (1941) was exciting to behold, since contemporary audiences can usually only view Noguchi’s work at the Noguchi Museum in New York City. Graham had traveled to the Southwest and observed a sect that practiced purification rites. She set the piece as that depicted by three characters, the Penitent, the Christ Figure and the woman portraying Mary as Virgin, Magdalen and Mother. It is a simple and powerful drama with music by Graham’s mentor, Louis Horst. The “seduction” section, a playful interlude danced by Oliver Tobin and Miki Orihara, was delightful, offsetting the penitential punishment. Lloyd Knight was the third powerful performer. The concert concluded with “Ritual to the Sun” from “Acts of Light,” a Graham work from 1981. The whole company, clad in golden bodysuits, danced this demonstration of the Graham technique with the power that only that technique can give. Its drama is in the execution of each amazing fall, jump, contraction and release. It is choreography in that the moves flow from one gorgeous skill to another, but to this viewer, it is still an extended class demonstration. Besides the dancers already mentioned, others are: Jacqueline Bulnes, PeiJu Chien-Pott, Mariya Dashkina Maddux, Andrea Murillo and Xiaochuan Xie.The media-montage, which preceded the dances and provided a good historical background, was by Victoria Geduld and Ellen Graff, who narrated. The lighting design is by Judith Daistman; costumes by Karen Young. Congratulations are in order to Lenore D. Naxon, director of the Eugene and Elinor Friend Center for the Arts, who presented the Graham Company at the JCCSF. Enthusiastic audiences would welcome them back again and again.